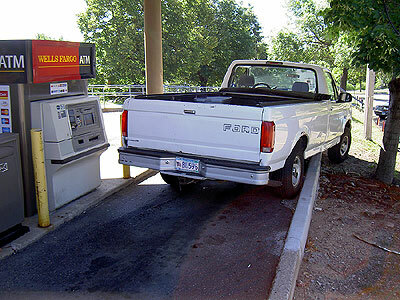 It's getting pretty bad when you can't even pull away from the ATM without getting inextricably stuck. I came across this in South Saint Paul Saturday morning. The ATM still worked. The driver who executed this maneuver was not in evidence. Nice. They probably don't have a limited slip rear diff and the unweighted left rear wheel is probably useless as it is just spinning. Your detailed ride reports are great. Now I'm curious to search out that bridge and check it out for myself. Having lived in the Twin Cities only two years, the first being in Minneapolis, I still have lots and lots of exploring to do in St. Paul. Thanks for giving me new ideas.